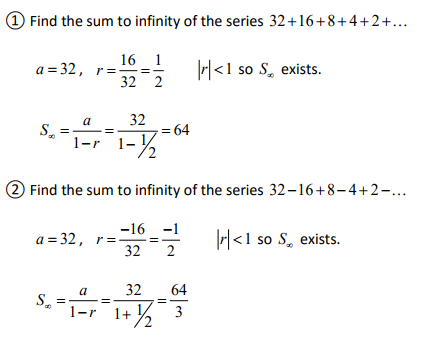 Unsure about the Sum to Infinity? A sound understanding of the Sum to Infinity is essential to ensure exam success. An infinite series has an infinite number of terms. The sum of the first n terms, Sn , is called a partial sum. If Sn tends to a limit as n tends to infinity, the limit is called the sum to infinity of the series. In the AH Maths exam the formulae below are given. Through step-by-step worked solutions to exam questions available in the Online Study Pack we cover everything you need to know about the Sum to Infinity to pass your final exam.